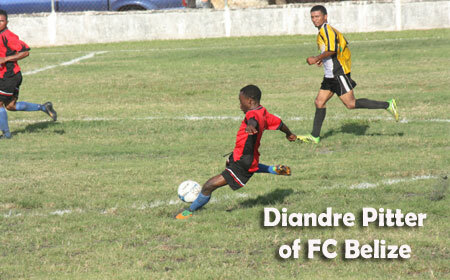 Scoring details are still incomplete, but in the only game on Saturday, BDF travelled to Independence and came away with a 2-1 victory over home standing Placencia Texmar Assassins. On Sunday, the home squad had a field day at the Carl Ramos Stadium, where Wagiya shelled the visiting San Ignacio United by a 7-nil margin. Meanwhile, out west at the Norman Broaster Stadium, Jerome “Jarro” James (28’) scored the only goal of the game, as defending champions Belmopan Bandits dealt former league leaders Verdes FC their second loss by a 1-0 score. The Bandits are yet to give a goal so far after 4 games played in this regular season. And at the MCC dust bowl (that’s what it has become) in Belize City, after a scoreless first half, Toledo’s King Energy/Freedom Fighters bombed FC Belize, 4-nil, with the first 3 goals coming within an 8 minute stretch that saw the speedy P.G. strikers confounding the FC Belize defenders. In a move that appeared to betray some dissension within their ranks, FC Belize veteran defender Albert “Allie” Thurton was substituted at half-time, only to pick up his gears and exit the playing area. Allie and young Jahron Myvette were replaced at half-time by veteran midfielder Mark “Kelo” Leslie and striker Oliver “Lionheart” Hendricks. But that did little to solve the problem the FC Belize defense was having, where left defender Matthew Leal was clearly overmatched by the speed of Toledo striker Dwayne Sampson. For their part, the Freedom Fighters increased their front line speed at half-time by inserting the explosive Derrol Lambey for Edwardo Oliva on the right midfield, increasing the nightmare for Leal, who was finally substituted after the third goal by young Calvin Reneau. There were some bright spots for FC Belize; their best opportunity coming in first half from young Diandre Pitter’s fine run on the right flank and sending a long overhead cross to find advancing FC Belize striker Brian Martinez all alone at point blank range, but his header went far wide of the goal. Toledo’s Anthony Williams was outstanding in goal, tuning back a couple good second half attempts from Lionheart and Kelo at close range. While the patchy and very dusty turf might have caused some mishaps in the FC Belize attack, it was the speed differential in the open field that worked to Toledo’s advantage, as they pounced on defensive errors near midfield and were off to the races. Freedom Fighters’ goals were by Derrol Lambey (61’), Dwayne Sampson (65’ & 68’) and Jevon Aranda (87’). It was a heartbreaking and embarrassing defeat for FC Belize who, like San Ignacio United, is now pretty much out of playoff contention. But with a number of rookies on their roster, the rest of this season may be a valuable learning period, with chances of upsetting a careless playoff contender. And come this Sunday, they will be about picking up the pieces, and trying to give their loyal city fans something to cheer about, as cellar dwelling San Ignacio United come to town both teams searching for their first season win. This weekend’s Week 6 match-ups are all very interesting. FC Belize and San Ignacio United will be battling at the MCC for pride and to get that first season “W.” In Belmopan, the only other winless team, Placencia Texmar Assassins will be feeling desperate for their first “W” to keep their playoff hopes alive, but it will have to be against a team that has not yet conceded a single goal, defending champion Belmopan Bandits. Police United will have their hands more than full against King Energy/Freedom Fighters, fresh off their big 4-nil win, and in front of their Toledo fans at Union Field. And it will be tribal war at the Carl Ramos, as the young Wagiya squad, brimming with confidence after their 7-nil drubbing of San Ignacio United, will be hosting league leading BDF, who have on occasion also used the Carl Ramos as their home field.